About a year ago, I wistfully confessed to my wonderful client, Cascade Harvest Coalition, that one of the things on my "dream jobs" list was to illustrate and design a cookbook - a year later they are making my dream come true. This is truly a community effort, with all of the recipes donated by wonderful (and prestigious!) 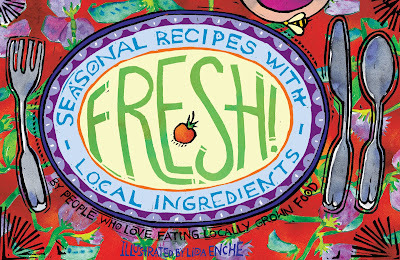 Western Washington chefs, farmers and people who love to eat and cook locally.